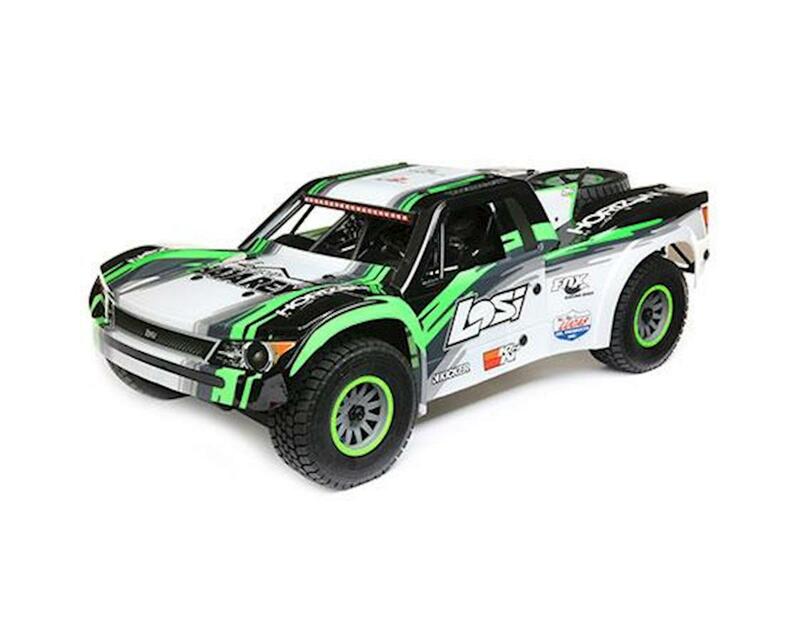 The Losi Super Baja Rey 1/6 RTR Electric Trophy Truck is setting new standards with its scale detail and adrenaline-pumping 50+ mph speeds. If you’re craving the realistic handling characteristics like the big boys, the long travel solid 4-link rear axle and independent front A-Arm suspension will not disappoint. Top it off with an authentic four piece body, full bodied roll cage, plus driver figures and this truck looks as wicked as it performs. Combine that with the precision control of Spektrum™ DSMR® reliability integrated with locked-in AVC® technology and you can SEND IT with confidence! Long Travel 4-link Live Rear Axle: Soak up massive whoops with the same realistic handling and movement of a full-scale desert truck. Long Travel Independent A-Arm Front Suspension: Rip across the terrain with confidence that your steering input stays true. Coil-Over Oil Filled Shocks with Pre-Load adjustment: Oil filled coil-over shocks on all four corners enhance the truck’s scale looks while soaking up the gnarliest terrain. 50+ MPH Dynamite Fuze 1/6th 1200Kv Brushless Motor and 160A ESC: Hit ballistic 50+ MPH speeds with 6S LiPo battery power. Full Bodied Roll Cage: Just like the 1:1 desert trucks, the Super Baja Rey truck comes with a super-rigid roll cage that enhances the truck’s scale looks and durability. True-to-Scale Body Panels: Four piece bolt-on body panels give the truck an authentic factory look. Aluminum Chassis: Super-stiff 4mm plate with a 4mm upper deck for added durability and performance. 4X4 Driveline with Adjustable Differentials: Full-time four-wheel drive provides amazing traction. The front, center and rear differentials control wheel spin and can be tuned for various conditions. LED Light Bars: Front and rear LED light bars cast more than enough light for running at night. Large Scale Servo: The robust Spektrum™ S904 waterproof digital servo is designed to handle whatever you can throw at it. Monstrous torque combines with lightning fast speeds to deliver the most intense Super Baja Rey experience possible. Rear-Loading Battery: The innovative rear-loading battery feature makes it possible to change the battery quickly, easily and without the inconvenience of removing the body. Full-Size Spare Tire: Not only does the spare tire add to the authentic look, it also serves as a true spare. Optional Spektrum FPV Mount: Adding the optional Spektrum FPV mount lets you easily install an all-in-one FPV (First Person View) system. When combined with the Spektrum heavy-duty FPV camera (SPMVA2510) and a headset, you’re ready to experience a driving sensation more intense than any other vantage point can offer. Spektrum™ DX2E ACTIVE™ Radio System: The Spektrum DX2E ACTIVE radio system offers advanced features like AVC control, a 3-position throttle limiting switch and travel adjust. It also has an expansion port that lets you add the Spektrum Speedometer or a Bluetooth module and phone mount to utilize the Spektrum Dashboard app. The Full-Throttle Freedom of AVC® Technology: The receiver's built-in AVC (Active Vehicle Control) system works behind the scenes, making hundreds of tiny throttle and steering adjustments per second, so more of the motor's power is translated into ballistic speed and acceleration instead of just flying dirt. Speedometer Add-On: Adding the optional Spektrum Speedometer allows you to instantly see your vehicle's speed in real time (other items may be required). It also records top speed and features an easy-to-read LED screen (optional accessories required). Spektrum Dashboard Mobile App: The Spektrum Dashboard Mobile application allows you to view everything from speed, motor or engine temperature, battery voltage and more. I put 4 sets of 6s lipo packs trough this car so far ran it twice through a grass field where it got caked with mud.Twice through the corn field by my house where it took a beating.Plenty of power very fun truck to drive a pain to clean don't like the little black body washers. I glued the under ones to the cage.The motor did not over heat.I wish lose would have used a metal rear drive shaft on this truck for all the power it has.Only time will tell how long the plastic one will hold up but so-far no problems with the car with the stock parts.But that's why they have after market parts when they are available for this truck.When aluminum after market parts are available for this 1/6 Baja Rey I will get a aluminum drive shaft and other after market parts to beef up the rear end.So far I love the truck.Its a blast to drive.Still driving this every chance I get.1 put 13 sets of lipos through this truck so far on 6s.I bin running this thing through the corn field by my house where it takes a beating.Still never broke anything on this truck.I like it better than my 1/5 scale RCs.The cups on the rear drive shaft have bin getting warm.Be sure to oil the bearings to the diff out-drives that go into the rear drive shaft.I use WD-40 spray gel lubricant on all my bearings drive cups and out drives.I find this works best. This is a FANTASTIC truck. It has held up to unreal levels of abuse and it just keeps coming back for more! It's the same length as the xmaxx and just a small bit narrower & shorter. I had some issues with the electronics a couple times but I contacted Horizon Hobby and they took good care of me. The only thing that I broke so far was the servo horn after like a month, which I replaced with another stock one and it has been fine ever since so I think just got a fluke. The body is starting to crack a bit too on the rear fenders, which is definitely expected after all the abuse this thing has taken though!